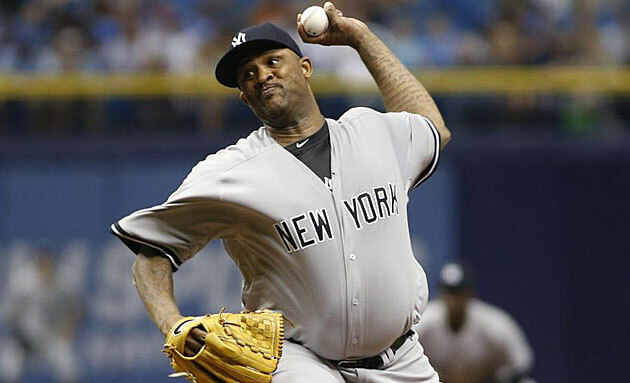 CC Sabathia finally has his first win of 2015, but has the hefty lefty turned the corner on his season? That, Kris Bryant's blast, Rougned Odor's demotion and more in today's Hit and Run. In today's edition of the Hit and Run column, we look at a notable promotion in Houston, explore the struggles of CC Sabathia, who finally found himself on the right side of the ledger this season with Monday night's win over the Rays, and more. Three days after collecting his first major league home run, the Cubs' Kris Bryant added his first Wrigley Field homer to his resumé on Monday night, blasting a two-run, first-inning shot off the Mets' Jacob deGrom. In a fitting bit of symbolism for a new era of Cubs baseball, the homer christened the newly-renovated leftfield bleachers, which were open to fans for the first time on Monday (along with those in centerfield). Via MLB.com, here's video of Bryant's homer, as well as that of Anthony Rizzo; the latter's landed in the still-under-construction rightfield bleachers, which are scheduled to open in June. Behind those homers, the Cubs downed the Mets, 4–3, to climb to 16–15 on the year. Bryant, whose blast was estimated at 436 feet by MLB Advanced Media's Statcast service, is now hitting .253/.398/.386 through 103 plate appearances, with five doubles, 19 walks and 18 RBIs to go with the two homers. Bet on more to follow. CC Sabathia once appeared to be the best bet among active pitchers to reach 300 wins, but the past two seasons have derailed his progress. On Monday night, he collected career victory No. 209—his first win in more than a year. By the line score, it wasn't exactly a masterpiece, as he allowed four runs (three earned) in seven innings in an 11-5 win at Tampa Bay. That said, three of those runs, including the unearned one, came in the seventh inning, after a quartet of New York home runs staked him to a 9–1 lead. Sabathia began the seventh by serving up back-to-back homers to Logan Forsythe and Joey Butler, with Asdrubal Cabrera later scoring a third run on a sacrifice fly. Sabathia did notch a season-high nine strikeouts, and via Brooks Baseball, his average fastball velocity of 91.5 mph was his second-highest of the season; he was at 92.2 in his previous start on May 6 against the Blue Jays. His 10 swinging strikes and 25 looking strikes were both his second-highest totals of the season as well, and it was just the second time this year that he allowed fewer hits (six) than innings pitched (seven). In isolation, one can chalk up high BABIPs and HR/FB rates to randomness or bad luck. But while the sample sizes for 2014—when he made his last start on May 10 because of a knee injury—and '15 combine to form less than half a season of duty by his previous workhorse standards, those inflated figures and the trend they form suggest he’s leaving pitches in the wrong place too often, and getting pummeled for doing so. While picking up the win—Sabathia's first since April 24, 2014 over the Red Sox—may symbolize a step forward, he’s going to have to improve to be any kind of asset to the Yankees, particularly given that he’s making $23 million this year and is owed $25 million for next year plus a $5 million buyout for '17, if his option doesn’t vest. When shortstop Jed Lowrie went down with a torn ligament in his right thumb, the Astros resisted the temptation to call up Carlos Correa, the No. 1 pick of the 2012 draft, but that day may be getting closer. On Monday, the team promoted Correa from Double A Corpus Christi to Triple A Fresno, just after the 20-year-old had been named the Texas League Player of the Week for the second time this season. Through 29 games, Correa has put up video game numbers, hitting .385/.459/.726 with seven homers and 32 RBIs and going 15-for-15 in stolen base attempts; he led or tied for the league lead in each of those categories. “Coming into the year we thought he needed to go to Double A… We weren’t sure for how long. I was thinking perhaps a couple of months, perhaps half a year depending on how he did. Asked if he considered promoting Correa to the majors, Luhnow conceded, "I have to say it is (tempting)." Via MLB.com's Brian McTaggart, Luhnow added, "We want him to help our club win at the right time, and that may be soon." The Astros were 12–7 when they lost Lowrie, who was off to a torrid .300/.432/.567 start but is likely out until July. Since then, Houston is 8–5, with light-hitting Marwin Gonzalez (.242/.254/.394) seeing the bulk of the duty at shortstop, making nine starts, and the even lighter-hitting Jonathan Villar (.182/.250/.182) taking the other four. Correa's promotion and Luhnow's comments strongly suggest, however, that the duo of Gonzalez and Villar is merely a temporary solution in Houston. • CORCORAN: Did Athletics push Jarrod Parker too hard after Tommy John? While Correa was climbing the ladder, elsewhere in Texas, a young and promising infielder was forced to take a step down on Monday, as the Rangers optioned Rougned Odor to Triple A Round Rock. The 21-year-old second baseman—who jumped from Double A Frisco to the majors in 2014 as the big club was beset by injuries—hit .259/.297/.402 with nine homers and four steals in 417 PA for Texas last season, but he was batting just .144/.252/.233 through 103 PA this year, with both his batting average and slugging percentage the lowest among all American League qualifiers. "Rougned definitely will be part of a winning formula in Arlington," Rangers manager Jeff Banister said. "We felt it was time for Rougned to go down and get back to being the type of player that got him here: gritty, gutty, tough at-bats, play routine defense, play with his hair on fire all over the place. "He is not unlike a lot of players who came up at a young age, had an amount of success, then the Major League atmosphere, Major League players, threw a punch at them. He needs to go down, get re-connected to the player he was, come back better and more capable of throwing a counter punch." Two years ago, the team's depth in the middle infield appeared bottomless, but between the shoulder woes that have cost former No. 1 prospect Jurickson Profar the 2014 and '15 seasons and the trades of Ian Kinsler and Luis Sardinas, Texas's options have dwindled like the production of Elvis Andrus (.223/.287/.292 so far this year). Odor was replaced at second by Thomas Field, a 28-year-old journeyman who previously had 33 games of experience with the Rockies and Angels from '11 to '13; he hit his first major league homer on Monday night, off the Royals' Yohan Pino in the Rangers' 8–2 win. Texas is now14–18 this season, fourth in the AL West but just a game out of second place.